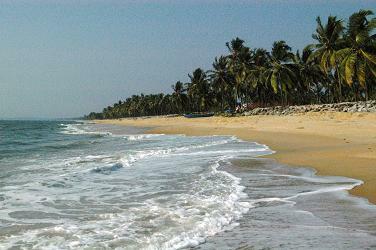 Kappad beach, or Kappadavu as it is known locally, is a quiet coast shaded by inland palm groves around a small, peaceful village not yet discovered by 'mainstream' tourism. There are two hotels near the beach, we were told by a group of boys on arrival, the expensive one and the other one. We stayed at the other one, and enjoyed some of our best days on Kerala's beautiful coast. This short guide gives some useful information about staying in Kappad, how to get there, what to see and where to eat. Most of all it is designed to inspire you, and give you ideas about the possibility of travel to Kerala (and India as a whole) in areas that are not hugely changed by foreign tourism. In the Kozhikode district of Kerala on India's south west shore, Kappad is part of a great chain of beaches that form a golden seam between the lush, tropical vegetation of Kerala's coast and the warm waters of the Arabian Sea. Kappad beach was the first beach seen by Vasco-Da-Gama when he landed in Kerala in 1498, beginning the Portuguese influence that is so prominent in Goa and Kerala. Leave the beach and find yourself in a quiet village shaded by dense vegetation of coconut palms, banana plants and tamarind, jackfruit and cinnamon trees. Amongst the tree tops you may see parakeets, egrets, sunbirds and drongos. The beach of Kappad has a rocky headland which gives great views of the surrounding coast. Walking along the beach either way leads to miles of deserted, yellow-sand beaches with only the odd fishing boat or egret for company. Climb the boulders by the banyan tree in the village to see an 800 year old Hindu temple to the goddess Devi. It is a peaceful place with views of the sea. Boating, including houseboat trips can be organised at nearby Elathur on the Korapuzha river. 16 kms down the coast and easily accessible by public bus (leaving from the circular track right behind the beach) Kozhikode/Calicut is the nearest large town. 19kms further south is the Kadalundi Bird Sanctuary on the Kadalundi river estuary. As mentioned, there are two options to stay in Kappad (though more may spring up next season). The Renaissance Kappad Beach Resort is right on the seafront and many rooms have views of the sea. The rooms are expensive - this is a luxury stay! We ate here and used their outside bar. We stayed at the Ponnu Tourist Home which is down a leafy side street just off the beach. Rates were around R.600 a night for good, clean rooms right in the treetops. Our friendly host pointed out local trees and their ayurvedic properties. Accommodation options are also available in nearby Kozhikode/Calicut. Away from the beach as you approach the main road there are a couple of places to buy Indian snacks and Keralan food - usually cheap and very tasty. We ate at the Renaissance but found the food a little over-expensive and bland. Fresh fruit, snacks and drinks can be bought at the shacks just behind the beach and small snacks are available at the Renaissance bar. If you have a day visit to Kozhikode, you will find plenty of places to eat, a couple of good places are along the Mavoor Road by the bus stand. 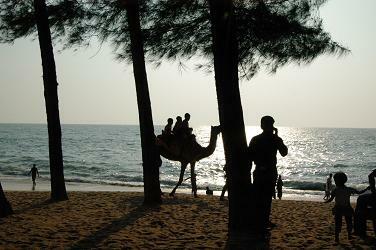 The easiest way to reach Kappad beach is by bus from Kozhikode. The bus stand for buses to Kappad is on Mavoor Road. Auto-rickshaws / taxis will also do the journey, it is a 16km trip so tuk tuks sould theoretically charge around R.200. Taxis will charge a little more. Kozhikode is well connected to other Indian towns by road and rail, and also has an airport (Calicut International Airport [CCJ]) which is 26 km from the train station in town. Domestic flights fly frequently to and from Mumbai. Tourist information such as maps, hotels and events is best gathered in Kozhikode. The KTDC Tourist Information Centre is opposite the KSRTC bus stand (main bus stand) on Mavoor Road. At Kappad beach there is an information point for tourists in the Renaissance hotel. We travelled through Kerala on a motorbike. If you are doing the same, or are considering two wheeled trasport in India, have a look at our Royal Enfield motorcycle section for tips and inspiration. 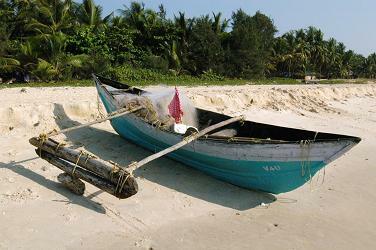 Find out more about the beaches of Kerala.